The Mild-mannered Explorer lay in his tent, feeling the cool morning air pass through the open windows. He’d dropped the canvas coverings of the windows when he crawled in the tent the night before so a cool breeze would evict the heat of the day. Mornings like this, in the North Dakota Badlands, are always cool and quiet. He could hear different bird songs as the sun started to peek over the bluffs to the east. Overnight, he had moved his sleeping bag so he could lay under the tent window, peering up at the immense cover of stars. His campsite was near the Little Missouri River in the cottonwoods. The wind in the cottonwoods rattled the leaves off and on through the night. Now, it was quiet. He knew others in their little campsite were rousing for the day. He could hear their footsteps. Six other family members and friends had camped nearby so it was not unusual that one or two would be up at sunrise. He knitted his brow – that’s a lot of footsteps. Why couldn’t people be quieter and let others sleep?! Even though he’d not yet crawled out of his sleeping bag he knew the day was starting. One of the Park’s main attractions — bison! Oh great, people are heading out to one of the nearby pastures to get a glimpse of the bison herd, he groaned. 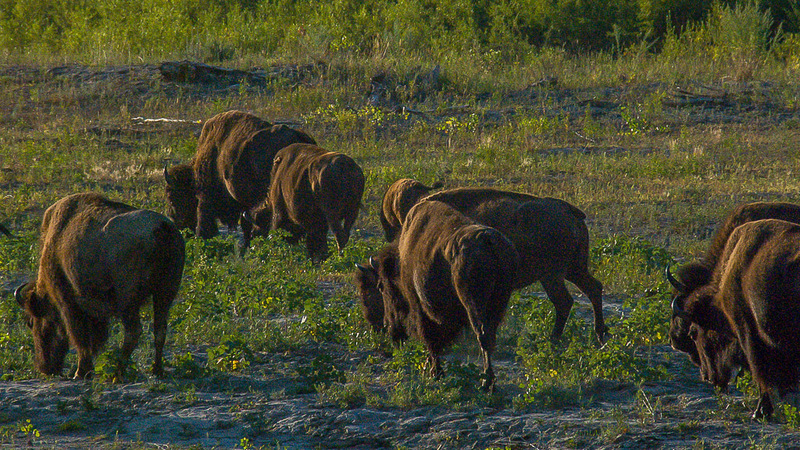 The North Unit of the Theodore Roosevelt National Park has about 220 head of North American Bison. A lone bull stands next to the road in the Theodore Roosevelt National Park North Unit. The day before, they had spotted a dozen or more young calves, some with their heads tucked up under their mothers, nursing. That meant herds would be skittish, highly protective of their youngsters. He was sure that Cousin Wayne knew that and would keep a larger-than-normal distance from the herd. Mothers in a bison herd are fiercely protective of their calves, and in fact, a whole herd will rally around the young ones to protect them from coyotes, wolves, and man. Another reasons herd were so active this weekend was that it is rutting season. The bulls are staking out their claims, sometimes running off other bulls in a physical battle. They would be in an aggressive mood, ready to challenge anything that would interfere with their intentions. Just a few days earlier, a tourist had triggered an attack, about 100 yards north of where the Mild-mannered Explorer lay in his tent. The tourist got gored and could have been trampled if another tourist had not intervened and saved the bleeding victim. Now is not the time to be fooling around bison herds. “Geez, I hope if those guys want to get photos of bison, they will give them plenty of room,” the Mild-mannered Explorer thought to himself. He tossed off the sleeping bag, found his jeans, pulled them on and crawled over to the door. He grabbed the door zipper and in one quick jerk unzipped the door and flapped open the canvas. Two young bison, one with a broken horn watch the mild-mannered explorer while he is still in his tent. It was hard to tell who jumped more, the Mild-mannered Explorer or the herd of bison at his door. They scampered (well, not really “scampered,” but as much as slow-moving 1,000-pound bison can scamper) down over the embankment next to his tent. He stuck his head out and could see only about half the bunch had passed by his tent, and more were coming. Cows, calves and a bull or two were headed his way. A nearly-defenseless calf, only a few months old pauses near the campsite. What appears to be its mother hovers and watches nearby, ready to protect her child. The herd walking past the tent included cows and calves. He ducked back inside and grabbed his camera. A few quick shots from inside and he was ready to crawl out quickly to take shelter in a cluster of trees . He planned a smooth exit, but the execution of the exit was a clumsy crawl out the door – erratic enough to attract the attention of the bull standing nearby. The canvas would offer no resistance if this beast wanted to repeat last week’s championship encounter with the tourist. While inside the mild-mannered explorer’s tent, this fellow came walking by. About 30-feet away one tree with three trunks offered the perfect shelter. He climbed into the three-prong crotch and watched the parade pass his now-empty tent. The bison herd moved down a ravine toward the Little Missouri River. Down a ravine toward the Little Missouri River, the herd ambled. Some stopped to munch on greenery, others moved on to join the Park’s herd of longhorn steers. He climbed up on a picnic table to get the final view of the herd moving toward the Little Missouri River where they joined a herd of Longhorns. There along the river, he saw his Mild-mannered Explorer partner a couple hundred yards downstream from the herd. Her light blue clothing stood out from the green and brown of the riverscape. The day had begun much earlier for her. She was roused out of a peaceful sleep from her tent where she had slept soundly in the cool night air. She discovered the longhorn herd was near the river. “Great!” she said. She had made it a goal earlier in the summer get photos of the Longhorns. She slipped on her sandals to follow a path toward the river, a path that would take her about 500 feet downstream of the Longhorns. The air was cool, but not cold – a good temperature for her since she was easily chilled. The air felt light and energizing. It took her less than 4 minutes to get to her shooting location with the sun at her back and the herd in front of her. As she photographed the Longhorns, she became aware of a moving patch of brown coming through the buckbrush and sage toward the river. The bison and Longhorn herds merged, went down the river bank and into the water of the Little Missouri River. She wasn’t afraid of them because she knew she could keep her distance, not startle or threaten the herd. Her plan was to remain as still and unobtrusive as possible, yet get the shots she wanted. 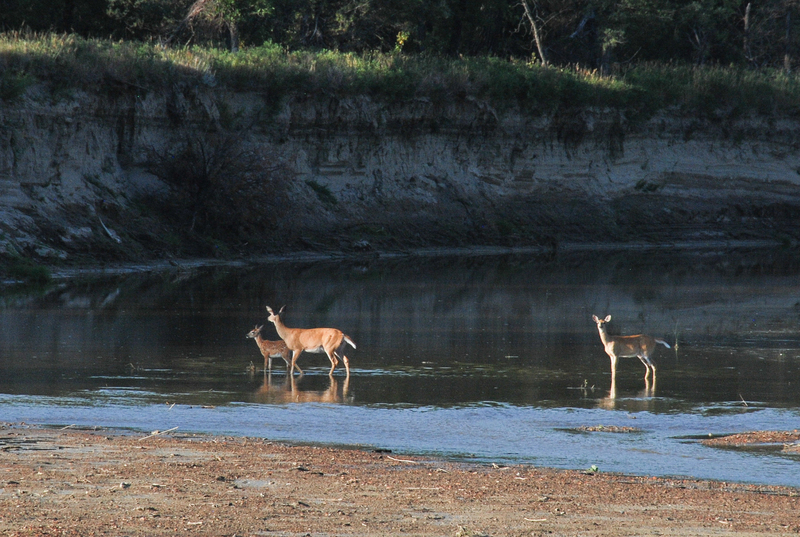 She figured out their objective as to get to the water and that they would pass by her some 300 feet away. “Oh my gosh! Oh my gosh!” she exclaimed to herself excitedly but silently. This was a moment she recorded mentally to store and recall forever. 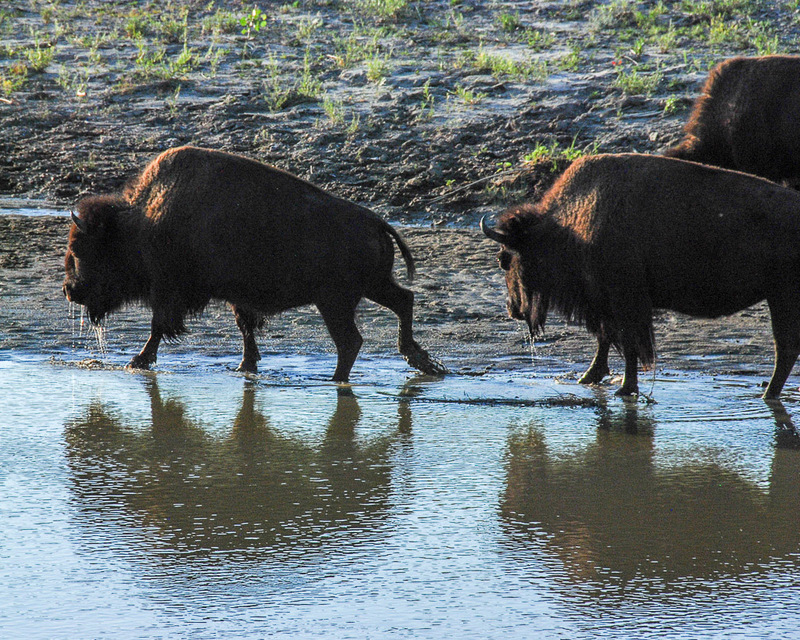 Once the bison herd got to the river, they kicked up a dust cloud clambering down the river bank to the water. A morning drink of water for the herd includes a refreshing moment for the youngest calf in the herd. Slowly, even gracefully, it took less than three minutes for the herd to get from the flat, down the bank to the water. She successfully held her position as the cows and calves went by. One big bull eyeballed her. He stood like a firm statue, keeping watch over what he thought could be a potential threat to his extended family. Once the herd had safely passed, and he felt the Mild-mannered Explorer was no threat, he followed the cows and calves down the embankment. 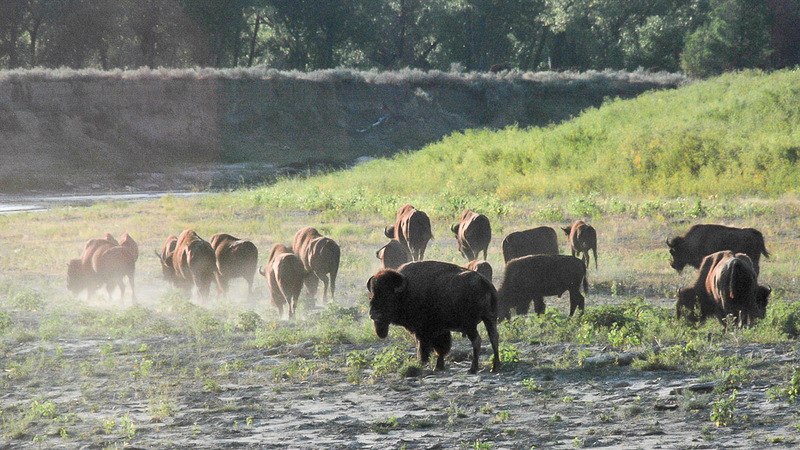 Dust was kicked up as the bison moved along the banks of the Little Missouri River, though they sauntered along. A protective bull kept an eye on the Mild Mannered Explorer as they moved. A herd of Longhorn cattle moves across a sandbar on the Little Missouri River. The Longhorns followed the bison into the water, the two herds melted into one thirst-satisfying group. The Little Missouri River is no more than 18 inches deep at its deepest part of the channel. So the water barely made it to the animals’ shins. They milled around, drinking and cooling. After a cooling and thirst-quenching dip in the river, one bison got down and wallowed in the sand. One bison got down and rolled in the sand while the rest of the herd followed the current downstream. They were in no hurry. The morning was cool, and they knew where they were going — to fresh pasture a bit east in the Park. Early morning watering from the Little Missouri River for this herd of bison which had just greeted campers at Juniper Campgrounds at the north unit of Theodore Roosevelt National Park. A cool July morning gradually filled with sunlight and a herd of bison joined longhorn cattle and mule deer for a refreshing start of the day at the Little Missouri River at the north unit of Theodore Roosevelt National Park. The Longhorns followed the bison into the water, the two herds melted into one thirst-satisfying group. The Little Missouri River is no more than 18 inches deep at its deepest part of the channel. So the water barely made it to the animals’ shins. They milled around, drinking and cooling. One bison got down and rolled in the sand while the rest of the herd followed the current downstream. In the distance mule deer copied the morning ritual, drinking before they retreated to the cool brush where they would linger and the day’s temperature headed back over 90 degrees. As the morning sun rose above the buttes of the Badlands of North Dakota these mule deer slowly made their way across the Little Missouri River, drinking as they went. A peaceful scene at the north unit of Theodore Roosevelt National Park. When they ambled downstream, out of view, the Mild-mannered Explorer took her final photographs and returned to camp, following the same path back that had led her to the river encounter. The herd of bison which had joined, and then left, the campers thirty minutes before they made their way down the river, continuing to graze and water in near silence. A variety of birds chirping and singing was the only sound heard. Back at camp, the rest of the small group of campers excitedly talked about their morning encounter with the visiting herd of bison. Some from the far eastern edge of the state were thrilled at the wake-up call they had received, completely unlike anything from their part of the state. They had wisely hidden their young dogs in the tent when the bison herd passed. What was a peaceful encounter could have been a chaotic disaster had one of the puppies broke free to do what puppies do with bison – bark and yap. The group of campers had a busy day ahead of them and the morning’s encounter was only the first of several monumental events to create an exceptional day of memorable exposure and involvement in the North Dakota Badlands. 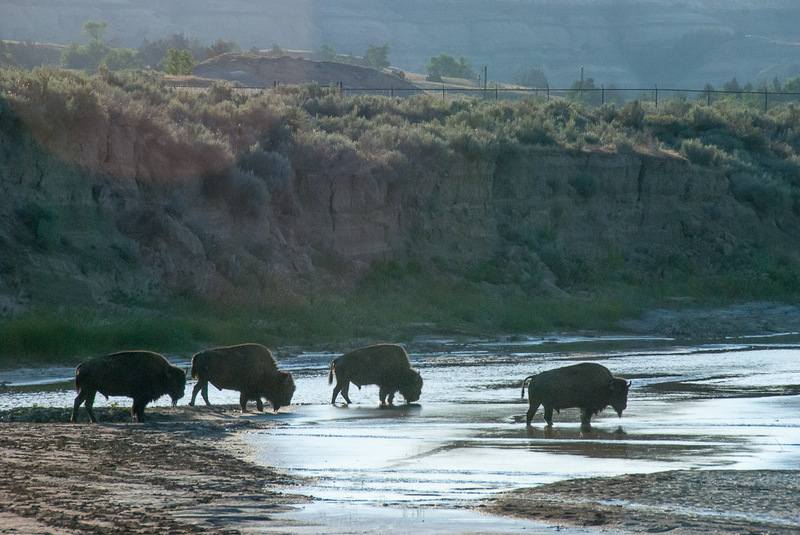 Click here to watch the amazing video of the bison moving to the river. Subscribe: We’d love it if you followed the tales of the Mild-mannered Explorers. Get notified when a new story is posted, just subscribe up there on top on the right side. 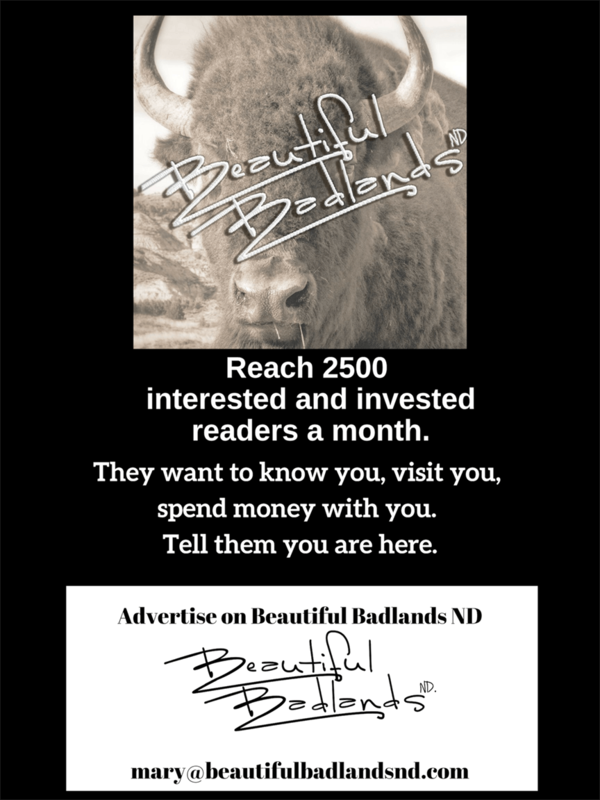 You’ll get an email notice when a new post goes up, Mild-mannered Explorers and other travel tips, tricks, and ideas from the Beautiful Badlands of North Dakota.